The 33rd AGM will be held on Friday 4th September at the Yungaburra Community Hall commencing at 7.30 pm. Our guest speaker will be Jenny Maclean, presenting 'Bat-mania'. Jenny will talk about her personal involvement with bats, the history of the Bat Hospital and the importance of bats themselves. The Bat Hospital has evolved over the last 25 years to become internationally known, and the Visitor Centre that opened in 2009 is #1 on Trip Advisor for the Atherton area. Since 2002, they have given over 20 talks a year at the Tinaroo Environmental Education Centre to schools from all over the far north. Education is a large part of their work as bats suffer from many media-evil and medieval myths. The Hospital works quite closely with researchers, and has recently been appointed as consultant to a large research project based in Singapore. It attracts more than enough volunteers from around the world each year especially in paralysis tick season. It has grown to the point of needing a full time Manager so it now has 2 full time staff with a large mix of volunteers. Local volunteers are always welcome, and essential to the sustainability of the Hospital into the future. Annual reports by the President, Treasurer and Nursery Manager will be followed by the election of TREAT office bearers for the next year. Members are reminded that they must be financial when voting for the new committee. Subscriptions will be accepted at the AGM. The evening concludes with a supper and plate contributions are appreciated. Everyone is welcome to attend. 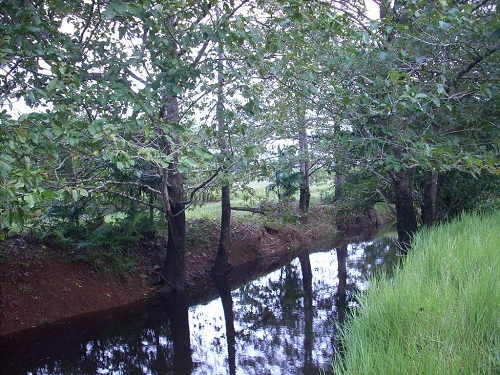 Peterson Creek on Bill and Laura Palumbo's property was planted with trees over a decade ago. Recently Simon Burchill in his search for weeds along the creek, noticed that a particular section would benefit from some additional planting near the water's edge, of Lomandra and Creek Cherry (Syzygium australe). 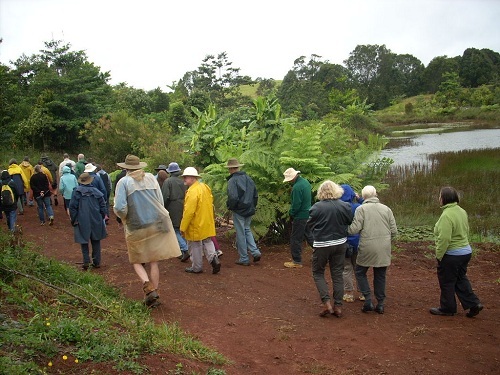 This event on Sunday 13th September will add to 'Bushcare's Major Day Out' celebrations across the country and will give TREAT an opportunity to show people through an older planting. Hopefully what we plant will be able to establish successfully before the next flood arrives. Meet at the Palumbo property, RN 80 Jallard Road off Peeramon Road, at 1.30 pm. Please bring tools to help dig holes for the plants in small tubes, as well as your usual gloves and trowel etc. We will walk to the site from the house and yards area and afterwards TREAT will provide an afternoon tea. Noel Preece and Penny van Oosterzee on their property at Upper Barron are conducting long term research into optimum methods for revegetation of grassed paddocks, using a replicated experimental design. They are also researching biodiversity habitat enhancement and carbon sequestration. Associated research involves ants, bees, flies, dung beetles, other fauna, microbes and plants. Their methods and initial results have been highlighted in 3 former TREAT newsletters: July-Sept 2009, July-Sept 2011 and Oct-Dec 2013. This is a much-anticipated field day. TREAT's plantings use methods which establish revegetation quickly in order to minimise maintenance costs. Members are keen to see how revegetation is progressing at Noel and Penny's property and what has been learnt so far. The property is at RN 1351 on the Upper Barron Road where it meets the Kennedy Highway. The driveway is single lane and visitors are asked to drive past the cottage to the house area where parking is available. Please car-pool. Meet at 1.30 pm for a talk and walk around and then TREAT will provide an afternoon tea. At the time of writing it looks like the warmer oceans in our region will not produce greater than average rainfall but should mitigate against the El Nino which historically has not caused us much grief at this time of year. Below average rainfall to our west has brought some of the nomads I suggested three months ago but I could not have foreseen the huge flocks of woodswallows which have been seen on the Tablelands and even reaching the coast. It seems that these birds have gone north now. Owls start breeding at this time of year. Listen in the forest for the hooting calls of the Rufous Owl and the bomb drop call of the Lesser Sooty Owl. The female Sooty Owls screech for the males to feed them. Perhaps this is a test of their ability to help feed the young. When driving along roads in the agricultural districts please be very careful of owls which may be sitting on the side of the road with their back to you. Grass Owls feed in the harvested maize fields and can be differentiated from Barn Owls by their longer legs, more blunt face while flying and in that the females are a lovely rusty colour. This is the time when the Rainbow Bee-eaters are present in their greatest numbers but as they leave for southern climes we can welcome the return of the larger cuckoos. Wading birds will also return from their northern hemisphere breeding grounds and it is likely that we will have abnormally high numbers of our Australian residents visiting if this dry weather continues for the western districts. 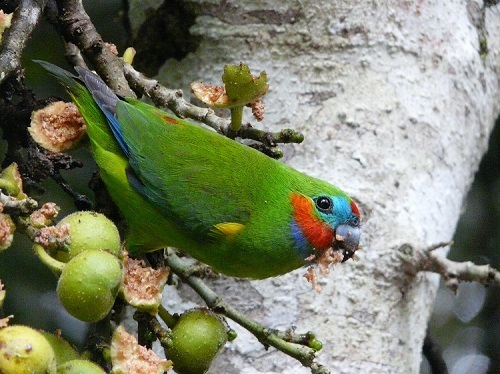 Double-eyed Fig-parrots eat the seeds inside the figs rather than the flesh we relish. This year with fewer than normal figs in good fruit they are resorting to eating Glochidion species. This is normal behaviour for these lovely little parrots. They will also eat the green growing tips of some rainforest plants such as Celerywood, Polyscias elegans. This tree will have ripe fruit over the first part of this period and that attracts many fruit eaters. 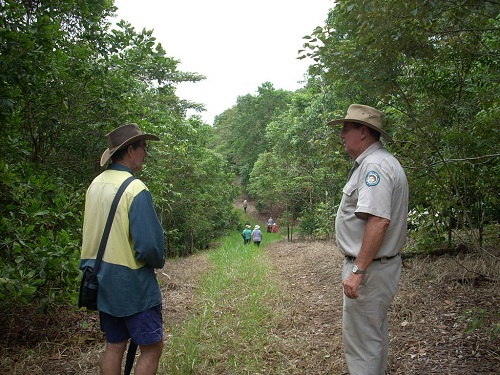 At higher altitudes this will include all the rainforest bowerbirds as well as the honeyeaters. If collecting Polyscias for propagation you will need to clean and sow the seeds promptly. Antidesma bunius, Herbert River Cherry, has fruited well along Peterson Creek in Yungaburra and a few other places. The fruit is tasty like a fresh apple and as the flesh adheres to the seed it is like an 'all day sucker'. Some fine jams and wine have been made from this fruit. Of course make sure of your ID before sampling any of our rainforest fruits. Of the Flindersias, F. pimentelliana, Maple Silkwood, and F. acuminata, Silver Maple, will be the first to ripen. Once mature the unopened fruit can be picked and left in a dry place to open out their starbursts full of winged seeds. Keep the dry fruit for painting as Christmas decorations. Silver Maple is also known as Putt's Pine for the Upper Barron settler who had a lot growing on his property. The Golden Bowerbirds will be happy to see Melicope broadbentiana ripening as they use them for decorations on their bowers. The bower is a bachelor pad not a nest. Other Melicopes to ripen at this time of year are the Evodia and Melicope bonwickii, Yellow Evodia. The laurels form an important part of the rainforest vegetation because of their numbers, about a hundred species, and the food they provide to frugivores large and small. Famous and wealthy people in ancient Greece wore laurel wreaths on their heads to confirm their importance, hence the term 'Don't rest on your laurels,' indicating the fleeting nature of fame. This European Laurel is Laurus nobilis but Caesar preferred Ruscus hypoglossum, from the asparagus family for his 'laurel' wreath of triumph. In Australia this family nearly always has alternate, entire leaves without stipules with the exception being Cinnamomum in which some leaves may be opposite. They are mostly trees of the rainforests with small bisexual flowers, usually arranged on panicles. Litsea and Neolitsea are dioecious: having male and female flowers on separate plants. The superior ovaries with one ovule develop into fruits which are drupes but the endocarp is so thin that they resemble berries. Cinnamomum laubattii, Pepperwood, with its dark green to blue-black fruit sitting in its 'egg-cup' receptacle provides food for many pigeons and other birds at this time of year. This character of a receptacle is shared by many genera in the laurels in the Americas but in Australia it is restricted to Litsea, Neolitsea and other Cinnamomum. Some of our laurels have large fruit like the walnuts, genera Beilschmiedia and Endiandra. Smelling like some kind of after-shave, Endiandra sankeyana or Sankey's Walnut, has black fruit, green flesh and a ribbed seed. The fruits of the Poison Walnut, Cryptocarya pleurosperma, are red with orange flesh. The seeds of this tree are broadly ribbed and fit their common name. The leaves are three-veined, obovate and shiny. Just because Cassowaries, Hypsies and rats eat the fruit is no reason for you to try. As we drive from Atherton to Tolga through Tolga Scrub, even enclosed in our vehicle we sense a different micro-climate in this veneer of vegetation from that in the surrounding farming land or in the urban industry just a few trees away. We might wish that more than a veneer had been preserved; some might even wish that farms would go and vegetation be restored. But those who cleared the land uncovered a valuable treasure - some of the best cropping land in Australia; land that sustains the Atherton Tablelands community, known to many as the Golden Triangle. This has been valuable agricultural land for many years now, but the change in land use brought drastic changes to water flows. Soil cover and high infiltration in forested land meant that soil and water mainly stayed in situ, with water infiltrating the deep soil, and the soil protected from removal. Farming led to reduced infiltration and to soil removal. Exposed soil broken up by raindrop splash was carried away in the extra water running from farms. This article gives a brief outline of the history of agricultural development in the rich red basaltic landscape east and north from Atherton, and the efforts to cope with the undesirable loss of water and soil that accompanied intensive farming of the area. Timber cutters of the 1880s were followed by farmers taking up surveyed selections in the 1890s and early 1900s (blocks of 20 to 40 acres). 'Homes were built of timber felled on lots and sawn locally. The very earliest settlers grew maize for animal feed for packers using Robson's Track, vegetables for the mining areas and had a few cows for butter and milk. Once the land was cleared and grassed, dairying became the stable industry along with some cropping' (from Petrina Callaghan's Kulara, Eacham Historical Society, p. 11). Retained organic matter in the soil and the small cropping areas of this system probably meant that soil erosion was not a noticeable concern until the 1940s when the widespread introduction of tractors allowed the expansion of cultivated areas to provide food for troops based on the Tablelands and in New Guinea - beans, carrots, cabbages, tomatoes, pumpkins and potatoes (Kulara, p12). Peanuts are not mentioned in this list but the district was found to be well-suited to peanuts and the Peanut Marketing Board had established a depot as early as 1933. After the war, mixed farming continued, with maize, potatoes, peanuts and pumpkins the major crops. By the late 1940s, soil loss and excess water runoff had become major concerns of farmers and local government. A public meeting called in May 1949 addressed the issue: one farmer suggested farmer training and noted 'a lot of erosion can be prevented by contour farming and the council can assist by seeing that water from the roads is diverted into proper channels. Grass cultivation and reafforestation on hillsides has been found very beneficial' (Cairns Post, 9 May 1949). These words of 66 years ago still hold good today. The meeting resolved 'That this public meeting of farmers and citizens is definitely of the opinion that soil erosion is an urgent matter and that the State and Commonwealth Governments be approached to organise and set up a soil conservation body equipped with the necessary machinery to combat this menace immediately'. The State Government responded by appointing a soil conservationist, Mr John Rosser, to the Atherton District. (The Commonwealth left resource protection to the States in those days.) Over the next few years John prepared catchment plans that enabled the slowing of run-off in paddocks through contour farming and directed water to waterways that would carry the water to defined streams. He also promoted crop rotations and stubble mulch farming, seen as necessary adjuncts to run-off control, promoting better infiltration of water. The plans were approved under the Agricultural Drainage provisions of the Local Government Act, with Council accepting responsibility for waterways designed to run along road reserves. Over time this has proven to be the Achilles heel of the plans; often not wide enough to carry the volume of water coming off farms, often not grassed adequately to prevent scouring and often taking water over greater distances and in different directions than would occur under natural flow. A lack of defined watercourses due to the low run-off in the traditional well-vegetated landscape added to the problem. Added to this, the same waterways have been expected to carry the water from growing urban development. The scars of this misadventure are evident in several places on the Tableland. On farm, contour farming has been of great benefit in reducing rilling and gullying and hence serious soil loss (although it is recognised that farming with contours poses difficulties for modern farm machinery, with need for longer and straighter rows using GPS equipment). 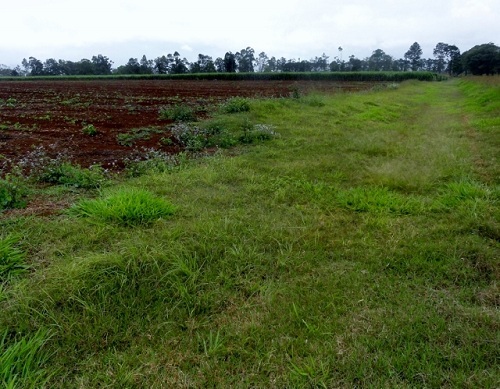 Farmers have adopted rotational cropping and have added grass-seed production into the mix, which has helped soil protection and regeneration, largely through build-up of soil organic matter. Sugar cane growing has increased and this helps stability but is a nutrient depleting crop. Unfortunately potato, peanut and grass seed crops all appear to require finely tilled seedbeds. This means lack of stubble cover and high vulnerability when so exposed to the onset of summer storms. It also usually means compaction due to tillage, with loss of infiltration ability. Soil organic matter, vital for holding moisture and nutrients is also a casualty when tillage breaks soil into fine particles. What is needed to conserve this immensely valuable asset for the future? On farm, the continuance of rotations with a grass phase is important, and the trend to horticultural tree crops such as avocados also helps. Practices that allow crop production without soil pulverisation and compaction need to be earnestly sought and implemented to improve infiltration and build soil organic matter. Although modern techniques might draw farmers to plough across contour banks at times, they need to be vigilant to the need to re-form banks between crops. As for the scoured waterways that carry too much water (from both urban and farm sources), on-farm improvements that would help include re-vegetation of less profitable slopes, contour deep ripping of stock-trampled pasture land, spreader channels (level channels that spread run-off onto grassland), or small detention basins at the end of diversion banks to hold back some water and reduce the peak flow. Perhaps interested groups such as TREAT can assist with re-vegetation activities that are often low priority non-profitable activities for farmers. To further reduce the speed and peak flow of water and so avoid damage to streambanks in the lower catchment, community/Council efforts might include widening and grassing of major waterways (perhaps requiring farmer willingness to have part of the waterway inside their property boundary) and, where suitable locations exist, large detention basins that can considerably reduce peak flow and also trap silt carried with run-off water. The detention basins at Griffin Road, Tolga, which were the result of a successful partnership between Barron Catchment Care and Tablelands Regional Council, demonstrate the benefits of setting such areas aside to protect downstream infrastructure, properties and streambanks. They also demonstrate effective community action, with the involvement of community volunteers in the vegetation of the site (see TREAT NEWS, Oct-Dec 2009). Barron Catchment Care is currently looking into the identification of new sites where detention and streamline repair would be the most effective. Through these measures, property owners (individually and in groups), community organisations such as TREAT, and local government can do much to improve the protection of the local landscape and its extension right down to the Barrier Reef, as well as assuring continuance of profitable agriculture. The possibility of gaining commonwealth money to help with this, these days (unlike back in 1949) adds incentive for all to cooperate in doing so. The focus in this article has been on the mixed cropping red soil landscape; similar principles would apply elsewhere on the Tablelands. A narrow, poorly grassed scoured waterway	and a wide, well-grassed stable waterway nearby. 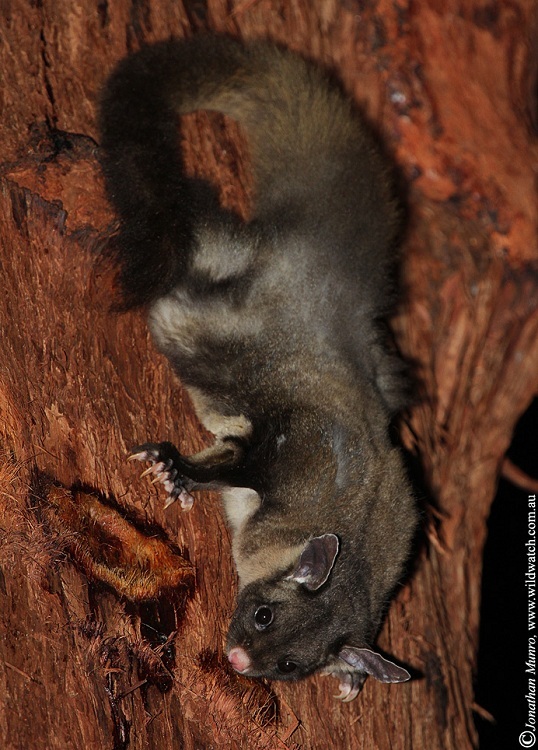 Recently many TREAT members helped lobby the State Government to protect the habitat of Yellow-bellied Gliders in the Tumoulin Forest Reserve. Here Rupert gives us a glimpse into the lives of these delightful creatures. Yellow-bellied Gliders or YBG are special to me for a number of reasons, some of which I can try to describe on this page. These are the best of all Australian gliders and are also the most vocal of all Australian marsupials (other than the horrid noises made by Tasmanian Devils). They use a number of different calls. They have a basic territorial call with some animals actually distinguishable from others because of the emphasis put on certain parts of the call. It is very likely that each glider can recognise the calls made by all the other YBG in their patch of forest. The territorial call can be delivered in shortened versions, in addition to which there are numerous other vocalisations, from affectionate soft churring to quite harsh calls signifying anxiety. One call I specially enjoy is a bold chuga chuga chuga which is given when a glider is swooping from one tree to another. This is most frequently heard when gliders are on what I call a joy-flight, two, three or more animals travelling rapidly across part of their home range on a young moon night. There are lots of other calls, as well as a few non-vocal communications like panting, which a glider uses when it is feeling a bit nervous about approaching another, not sure if it will be allowed to feed alongside. YBG live in small groups, a dominant male and two or three adult females. Youngsters commonly stay with the group for about the first year of their lives, even male young, while females may stay with the parental group throughout their life. A group may therefore include two or three youngsters growing up together, which brings rise to an enjoyable facet of YBG behaviour: these gliders play. Most of their playing is a sort of cuddly wrestling, rolling and squirming about together, the marvel being that this goes on while the animals are hanging from a branch, perhaps just one of the players using just one hand or foot to hang by, while tussling with its playmate. Sometimes a third animal will run up to join in the play, so there is then a three-tailed ball of grey fur coiling and twirling about. Only very occasionally might there be a small squeak from a participant who gets nipped during the game, and never have I seen players fall from a branch. YBG have a very complicated way of sharing scent in the group, all members obtaining the scent of the dominant male, which has three active glands: one on the chest, one on top of the head and one on the tail, about 4-5 cm from the base. The higher the rank of an animal, the more likely it is to be approached by a lower rank animal wishing to perform what I call 'head-rubbing'. The approaching animal pushes its head under the tail of the other in order to rub the top of its head firmly up and down against the tail of its companion. Now, if the tail is that of the dominant male the head rubber will obtain scent on top of its head. If the animal receiving the head rubbing is not the dominant male it will gain scent on its tail from the top of the head of the animal which performs the rubbing. Complicated, yes. The dominant male sometimes donates a head rubbing to a group member, which means that scent from his head will be applied to the tail of the recipient. The all round result is that all members of a group obtain and share the scent of the male. What seems certain is that head rubbing is pleasurable for the recipient, because it is never repulsed, nor does an animal receiving a rubbing walk away from the ceremony. Very occasionally, if an animal of junior rank comes along to feed beside a more senior animal the junior may get a slap, at which the junior will rush around to the rear of the other to deliver a head rubbing as an appeasement, rather like a child belatedly remembering its manners when coming to the table. Apart from sap, pollen, and nectar, YBG eat insects of many kinds. They scrape psyllids and lerps off leaves, scrape scale insects off the peeling bark of Rose Gums and catch cicadas. I have never seen the moment of capture, but have often watched a glider demolishing a cicada -- clinging to the smooth bark of a Rose Gum with only its hind feet while breaking the cicada apart with its hands. First the innards from one handful is extracted, then the other handful, with the remains simply chucked away when the snack was finished. In the days when I worked hard to establish the varied diet of YBG it was necessary to be sure that they were definitely eating cicadas, which meant staggering about in the undergrowth searching for the empty shell right after it was tossed away by the hunter. Tablelands National Parks Volunteers have just produced an information booklet on the YBG. They can be contacted by email or by post through their secretary. Secretary TNPV, PO Box 1250, Atherton Qld 4883	secretary@tnpv.asn.au. Tony, originally from Portugal, came to Australia as a young man in 1967 and worked at various jobs around the country including some in the Tablelands, eventually settling in Darwin, building up and running many businesses there. He always remembered the lush country around Malanda, and late in 2009 he convinced the family to come and look at where he had been more than four decades earlier. They liked the place and so decided to buy a property on the outskirts of town. He and wife Linda came to TREAT soon afterwards and decided they would like to be involved in revegetation. 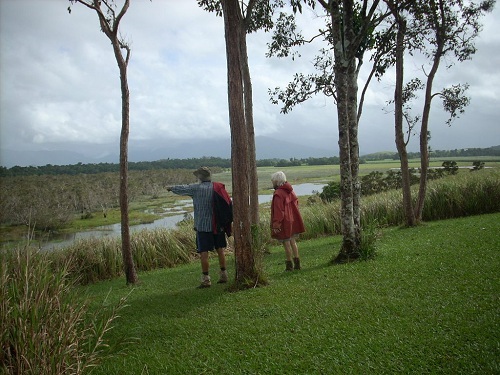 To start their project, Tony contracted to have the western boundary of their property (next to the Millaa Millaa road) planted with blocks of rainforest trees. The trees planted on the boundary closer to Malanda did much better than the ones on the other side. Then a large lagoon was formed and more trees planted with lots of cardboard and mulch laid down, and pink frost guards appeared. This development over recent years has been an interesting process, and the TREAT field day at the property on 16th May brought together thirty-one people keen to look around with Tony. He led us down the hill to a recently planted section which he calls the Orchard. Here were Davidson's Plums (Davidsonia pruriens) and Tamarinds (Diploglottis diphyllostegia), being grown for a new local business processing native fruits. Tony reasoned that the Tamarinds would help protect the fruit of the Plums from the hot sun, as they largely fruit from the trunk and branches. A couple of years ago his plantings had been badly hit by frost. Tony therefore decided to set up irrigation at the Orchard, not only for quenching the trees' thirst but to also help with the frost. The first time it was needed was on the morning of July 14 when the temperature came down to 4 degrees. Tony believes the orchard was saved by the sprinklers. With plenty of water, well fertilised, weeds kept under control with cardboard and cane mulch and prunings for extra mulch, these trees appear to have everything they need. Then we proceeded on to the dam area. One of the attractions for the family to acquire the property, was that there seemed to be springs in the area. This proved correct because after removing in excess of 50,000 cubic metres of weeds and silt from the bottom of the gully which ran through the property, a large lagoon formed. This was soon a home to platypus and a stopover for migrating birds. Many trees planted in this section hadn't done well but Tony is persevering with replacements and more mulch and gradually things are improving. It was suggested that the gully spoil spread over the area when the dam was created, was probably lacking nutrients. Now the area is gradually regaining nutrients with the mulch breaking down. At the dam we saw some weeds pushed into a big heap. Tony used to take his weeds away to the dump, but then decided to leave them on the property. He found that his big heaps gradually broke down into useful soil and mulch and he added them to the edge of his access road around the dam. This has been a very successful strategy, and the bananas growing there have enhanced the process further with their stems being used as logs to prevent erosion into the dam. Gradually enough ground has been acquired to enable trees to be planted between the access road and the dam and these are thriving. After crossing the creek we headed up the slope on the other side and looked back across a gully area to the dam. A large patch of Lomandra had been planted to replace rocks put there for erosion control. As we walked on past more revegetation blocks, Tony talked about maintenance of his plantings. Like most of us, he found that he was always short of time to do the maintenance which looked so simple at the beginning. He thinks he knows why some the original trees didn't do so well and hopes to learn from what happened. Many of his successes have come about with experiments, errors being part of that, but most have succeeded with hard work. Tony now does most of the work himself with the voluntary help of his nine year old grandson Jarrod. It is all going to take a while but providing his health stays reasonable he will get there. One thing he has learnt, since he doesn't like using sprays, is that the only way he is going to keep on top of things is to plant just a few trees at a time and immediately place down the cardboard and cane mulch, as well as the tree guards. Grass competition is still an ongoing problem. Tony pulls most of his weeds by hand and this is very time-consuming. When he has to deal with bigger Tobacco weeds, he uses the bobcat and chain to pull them out by the roots, often with help from Jarrod who is already seeing his bank account show the result of his efforts - like his mother Rosemary did when she was Jarrod's age working in a family business in Darwin. Pinto Peanut grows on some parts of the property and Tony believes this will act as a living mulch to suppress grasses and other weeds. Many of the trees, however, are now forming a canopy cover and shading out weeds. On our walk back to the house for afternoon tea we passed some Atherton Oaks (Athertonia diversifolia) at wide spacings. These, Tony said, were planted simply for their visual beauty. He also told us the birds could eat his Orchard fruit if they got to it before he did - a man at peace with nature. After the showery conditions on the walk, afternoon tea on the patio was most welcome. TREAT's fare was graciously augmented by Linda's cooking - a great afternoon. Postscript from Tony: Regarding the plantation, I have had so many people giving me advice that I would not be able to remember them all, so I will not try. But there is one person whom I feel I have to mention, not because of the work we have done together which is immense, but because to me it is educational. His name is Andrew Lilley and one day he turned up with a chainsaw and said "You have a bad weed there and we should get rid of it." I looked at this beautiful tree, towering all over the others and asked why. Andrew showed me the seeds, and the little trees already growing around the big one and said, "This is an African Tulip, and if we don't get rid of it the place will be riddled with this weed and the native ones will not have a hope." So down it went. TREAT members at the field day and Lomandra planted in gully. Historically, this fresh water ecosystem was being radically degraded by farming practices of cane growing and cattle grazing. In the 1960s the State Government even considered a proposal to fully drain the swamp and realign the mouth of the Russell River to enable more such farming enterprises. Local environmental groups fought against this and fortunately, both for the environment and for financial reasons, were successful in preventing this occurring. However, a massive main drain and many smaller drains had been dug throughout the area. Farming and fire management changes had also encouraged vegetation alteration, with massive weed invasions. Eventually it was realised that farming was impractical. The core area was gazetted as a National Park in 1980 and portions of the unsuccessful farms were gradually added, the latest in 2003, bringing the total area now to around 2100 ha. It is one of the most important wetland areas in the Wet Tropics bioregion, supporting several rare and endangered plant species as well as at least two endangered regional ecosystems. The NP team, led by Les Jackson and advised by Peter Stanton, have had major success in restoring these ecosystems. This is more astounding when it is realised that they also manage the Josephine Falls area of Wooroonooran NP, Russell River NP and do fire and weed control in Ella Bay NP. Restoration work at Eubenangee has revolved around hydrological modifications, weed suppression, fire management, establishment of vegetative firebreaks and tree planting. Work access is usually only possible for 6 months of the year. Because the main drain between Dinner Creek and the Alice River was dug over 40 years ago. 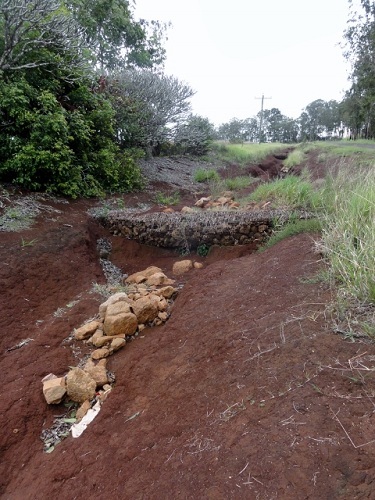 it is legally considered to be a permanent watercourse and apart from minor work cannot be altered. 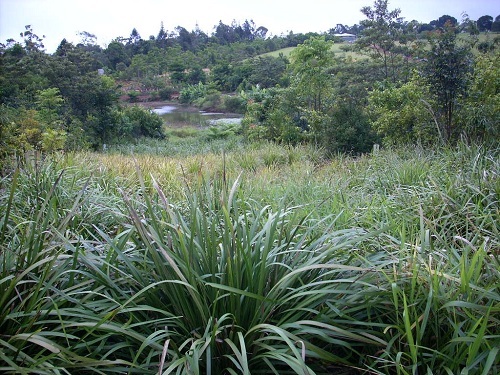 Problem weed species such as Pond Apple (Annona glabra) and Yellow Guava (Psidium guajava) and exotic grasses such as Brachiaria humidicola, Brachiaria mutica, Melinus minutiflora and Panicum maximum have all been largely eliminated. Pond Apple eradication, on this scale, has never previously been achieved anywhere in the world. The altered fire regime involves mosaic or patch burning on a 4-6 year rotation for the grasslands and 10-15 years for the Melaleuca swamps. This stimulates native species and assists control of exotic species. Some of the tree plantings were flattened by Cyclone Larry, however regrowth has been astounding with little damage now visible. Tree planting to restore habitat, and as firebreaks, continues. Planting is usually in winter, about 2 months after weed spraying (one or two sprayings as necessary) with the dead matter acting as a mulch. Tree spacings have been reduced to 1.5 m, fertiliser added and fast growing species are used to aid quick canopy closure, thus reducing maintenance. Good mulching is essential. Leichhardts (Nauclea orientalis) are planted in the wetter areas. Quandongs and Alphitonias are especially beneficial as they have horizontal branches for bird perching which brings in other tree species. So far 23,000 trees have been planted in the new area (2003) in the last 12 years. This is over and above approximately 20,000 trees planted mainly in the riparian zone of the Alice River since 1980. The winter planting is to make the most of their best growing season which is during spring. Wildlife now abounds. The area is a favourite for bird watching, with agile wallabies present and also saltwater crocodiles which feed mainly on turtles. There was a 4 metre plus saltie, 'Hercules', clearly visible from the lookout on Grassy Hill most of the time we were there at the field day. The weather threatened to be challenging but apart from one light shower it was a perfect day. Our thanks to Les, Ken and Doug for their enlightening walk and talk, and for their past work in making the restoration of this area such a success story. Vegetative firebreak in the 2003 area, Crocodile spotting from Grassy Hill. After a bit of a dry start, this year's infill planting at Massey Creek is now well established following some fairly decent rainfall spread over the last couple of months. Nursery staff have had to fall back on running irrigation at the site just once or twice during the initial growing phase. Peter and Simon have quite impressively managed to stay on top of the weeds between wet weather events and with welcome assistance from Conservation Volunteers Australia, were able to give the trees a round of fertiliser as well. The scheduled replacement of plant racks and weed matting in nursery bays 1, 2 and 4 went ahead as planned in early April. The work was completed in around 2 weeks due to a huge effort from nursery staff and assistance from QPWS Lake Eacham staff on a number of days. The new plant racks are now much easier to work with being redesigned to a greater height than the old concrete block design. The new stands, designed by Peter and manufactured locally, not only provide an improved working height but are easier to clean around and offer far fewer harbourage areas for weeds in the nursery. Distance between the racks has been increased to improve manoeuvrability and allow nursery trolleys and wheelbarrows to be used along the rows rather than just at the end of the racks. Funding for the stands was sought and gained by TREAT from the QPWS Friends of Parks grant program in 2013 with an additional $3,000 of funding provided by the Charles Viertel Family Trust through the FRRR (Foundation for Rural and Regional Renewal). While some of the pipe and steel mesh component of the old racks was able to be reused, much needed replacing. The Alf and Meg Steel Fund, Australian Communities Foundation, again through the FRRR, kindly donated $2,000 for these in April. Further funding is being sought to enable rack replacement in bay 3 of the nursery. The nursery is planning two new projects with QPWS Cairns and Innisfail districts. We will be collecting and growing propagation material for a number of roadside planting sites on the Goldsborough Valley access road managed by Cairns Ranger in Charge, Dan Fitzpatrick and Ranger Leigh Willis. Innisfail South Ranger in Charge, Audrey Reilly and her team have recently taken over management of day use areas along the Tully River from QPWS Ingham and with assistance from nursery staff have commenced works planting and redefining the site. Whilst not major projects, collection, propagation and planting of suitable species will continue for a number of years depending on each units' resources and capacity to maintain their projects.